Sequels almost never live up to the hype, and often can’t even approach it. Sometimes, they’re woefully inadequate in the eyes of many. Think back to the experience of watching The Matrix, the resulting fervor surrounding Reloaded, and how you felt walking out of that film. I’m the wrong one to ask, as I loved the entire trilogy, but even I have to admit the original was the far better experience. Far better. It’s tough to try and recapture the magic, because the freshness has worn off, and generally writers, directors, and even actors attempt to ramp everything up to the next level, rather than delivering a refined, smarter version of what already clicked. Bands that consistently sound different on every single album often provide an excuse for new fans to jump on board and older fans to run for the hills. If you like a sound, and that sound changes, or someone moves from plenty of guitar work to a plethora of electronic music, the effect can be alienating. The Duffer Brothers caught lightning in the nostalgia bottle in 2016 with Stranger Things, which set the binge watching populous ablaze in the most positive of ways. The series became an instant cultural touchstone for the year, with numerous references in other properties, plus the Saturday Night Live and Jimmy Fallon treatments that always reveal something that’s grown to a level of popularity where it’s smart to lampoon that effort. The first season of Stranger Things featured eight well-crafted, if imperfect and occasionally irritating from a congruency standpoint episodes that paid off with a satisfying conclusion. It was open-ended enough to allow for further installments, but it was also a season that could have stood alone and been received well across the board. While the acting was sometimes cheesy, plotlines (for instance, Barb) not fully developed, and a few episodes overly lengthy based on the included content, it was a strong viewing experience. When you succeed as this show did, the possibilities for wrecking what was rolling freely down the highway by continuing the story is great. I’m happy to report to you that’s not the case with Stranger Things 2, which brings Mike, Dustin, Lucas, and Will back into our lives, this time with both old friends and new additions along for the ride. This tribute to the sci-fi, thriller, and horror classics of the 1980s returns focused, and despite some early creative blunders, finishes on a major high note. There will be a full blow-out review next week, perhaps broken down by episode, filled with spoilers, but this is not that piece. You haven’t had time to see the show, and it’s not my job to ruin the show for you. It’s my job to tell you what I thought of it, and in this instance, that’s a good thing for Stranger Things 2. Although the first season was a lot of fun, I enjoyed the trip BACK to Hawkins, Indiana just a little bit more than the initial vacation. The advantage a sequel has is familiarity. We know and love these people now, or in certain cases, we despise these people. The challenge is in staying true to what made it work in the first place, but offering up enough “new” to make it feel unique and worthy on its own. Without a doubt, that’s what the Duffer Brothers have done for the most part, as though you’ll find things you greatly dislike and relationships that arrive simply to buy time before handing you what you really want, you’re happy to be in this world again. The kids are a year older, with the story beginning just shy of one year after the conclusion of the first season. If you watched the Season 1 epilogue, you saw a tease for the next monster, and the continuation of the problems in the area. Within a half hour, things are weird again in Hawkins, and not just because Paul Reiser is playing a doctor, although that’s definitely off the beaten path. 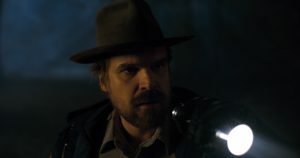 Once again, David Harbour shines as Jim Hopper. While most would invariably say Eleven if you asked for a favorite character, I gravitated to Hopper and Dustin (Gaten Matarazzo), with Millie Bobby Brown’s “special” girl in the mix with them. One very cliched move happens early in the season involving Hopper’s current standing with Joyce (Winona Ryder remains great in this crazy role), and again, it’s done to fill nine episodes and stretch out the story. It’s mildly annoying, but it’s also to be expected. This unnamed situation also places Hopper as our hero almost immediately – if there were any doubt before that point – and it provides a new personal foil for him in the form of Sean Astin, which I got a kick out of considering The Goonies (which is one of the series’ biggest inspirations) and his ties to the 1980s. Everything you like about Chief Jim you will hate about Astin’s Bob Newby. But, you’ll understand why he exists as well, because it makes sense to the relationship side of the series. You have to be asking whether Barb is addressed, considering that was the running joke for the past year plus, and the short, careful answer is yes. There’s more. It isn’t just dropped and never mentioned. That’s all I’ll say. Some sequel-itis is easy to detect, where the foundation crumbles a bit under the weight of expectations. It does have a feel of “we want it to be bigger and better,” but not to the level of so many “Twos” that have fallen off the cliff of the mountain built by “Ones.” Plus, we spend some time with Will Byers, and see the vulnerabilities and insecurities brought on by his ordeal. All the child actors do a great job again, as their sometimes overdone moments are both perfect for the nostalgia of 1980s motion pictures (including Ghostbusters, which gets plenty of screen time) and also for the idiosyncrasies of kids in these scenarios. Dustin remains my favorite, with Lucas jumping into the second slot this time around. The two battle early over a new female, played by Sadie Sink, and it’s fun to watch. Matarazzo is hilarious in the opener, and his purple brontosaurus Minnesota Science Museum hoodie will almost assuredly be sold by some smart website or hipster store. One observation: After watching Finn Wolfhard (Mike Wheeler) in both seasons of Stranger Things, as well as 2017’s blockbuster horror remake, It, I don’t think I could ever watch him in something that DOESN’T take place in the past. He looks like he’s from 30 years ago. Plus, that name alone. Seriously. It’s pretty amazing. If you dug the first season, I would be surprised if you don’t dig the second. It mixes frights, laughs, and dramatic sequences effectively, is confident in its story, and packs a fantastic punch of fiction into this Halloween weekend. Plus, the second season begins almost identically to where we are in 2017 respective to the time of year, so it will feel perfect for you and your family as you jump into it. I read a few comments from critic colleagues that have mentioned Stranger Things 2 is the rare show where the people that love it and hate it are going to say virtually the same things about it. That’s true. What I disliked about the story…you’re going to dislike. What I loved about the story…you’re probably going to really enjoy as well. There’s a good bit of black and white to be found here on the extremes. As subjective as entertainment is, I don’t anticipate a great amount of debate, except on degrees of certain highs and lows. I THINK I liked it better than the first season, but it’s close. That’s all you really need to know. There’s not a marked dropoff in any way from the first eight episodes to the new crop, and if you’re a fan, you’re going to be a bigger fan. It’s such a fun show to lose yourself in and simply enjoy. NEXT WEEK: Full spoilery reviews, episode by episode, in depth. It’s going to be a lot of fun. This weekend, enjoy these nine episodes, and if your child isn’t 13, I’d suggest watching it with him or her. If your child isn’t ten, I’d suggest not allowing the watch just yet. Wait a year or two. The imagery remains fairly frightening for young audiences, and it’s a show that’s going to hold up well. Wait until the kids can fully appreciate it, or at the very least make it a family experience. I’m @JMartOutkick. Mornings are for coffee and contemplation.